GOVERNMENTS CAN HACK YOUR WEBCAM. JOIN OUR FIGHT AGAINST THEM! Privacy International holds Governments to account for their extraordinary expansion of surveillance powers. We now continue our fight in a groundbreaking court challenge against the UK government. Exciting news! Our case is going all the way to the Supreme Court! Governments can’t enter and search our homes without good reason. Why should they be allowed to break and enter into our electronic devices if we’re not under suspicion? The UK government has given itself the power to use ‘general warrants’ to secretly hack our computers and phones. In doing so, the British government can gain access to the emails, text messages and photos of potentially tens of thousands of people at a time wherever in the world they live - even if most of those individuals are not suspected of any criminal behavior. They can even switch on your camera or microphone so that your devices are spying on you! We have been fighting the UK government in court for three years now and are facing significant potential costs. If we lose, the court may order us to pay the cost of the government’s very expensive army of lawyers. We have a ‘Protective Costs Order’ which currently limits our potential costs to £25k – but that’s still a lot of money for a charity with very limited resources! So we need your help in raising this money. An anonymous supporter has offered to match all donations (up to £12,000)! So any donation you make will be DOUBLED in value! We now live in a world where more and more people take growing Government surveillance as an unavoidable reality. And you may think that if you have nothing to hide, you have nothing to fear. But the government can’t enter and search our homes without good reason, so why should they be allowed to break and enter into our electronic devices if we’re not under suspicion? The British government claims that hacking is about public safety. But hacking actually makes us less safe because it compromises the technology that is increasingly embedded into the fabric of our lives. By hacking our devices, the government is choosing to take advantage of security holes, which leaves us all more vulnerable to future cyber-attacks. By hacking, the Government has deliberately chosen to make our technology less secure than it can be. Any donation you make, large or small, will help us both fight this important case and protect the future ability of Privacy International to fight for people’s right to privacy all over the world. 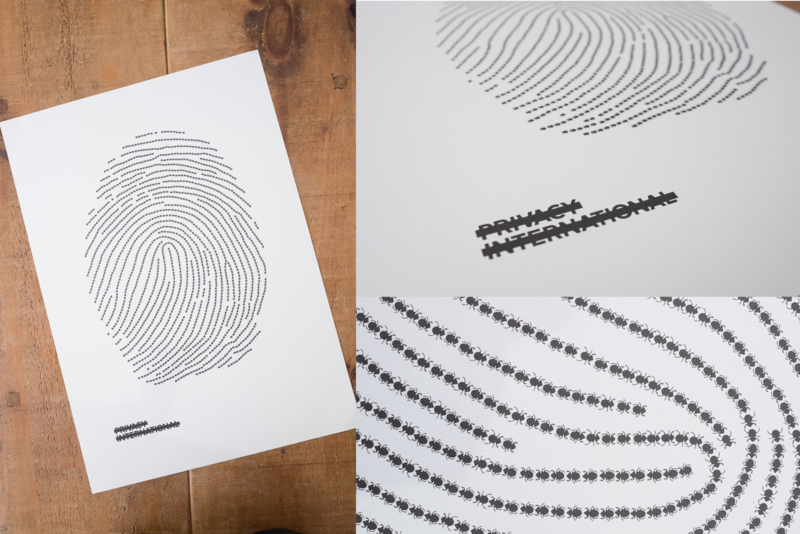 Pledge £50 or more to receive the double-sided 'Universal Declaration of Human Rights' print below, or £100 or more to receive both the print AND our large 'Fingerprint' poster. A double sided print of Article 8 of the Universal Declaration of Human Rights. On the reverse is a Bridget Riley inspired print of the same text, typed in morse code. Printed on A3 (29.7cm x 59.4cm) high quality 216gsm paper. A poster of a fingerprint comprised of hundreds of tiny bugs. Printed on A2 (42.0cm x 59.4cm) high quality 216gsm paper. A double sided print of Article 12 of the Universal Declaration of Human Rights. On the reverse is a Bridget Riley inspired print of the same text typed in morse code. Printed on A3 (29.7cmx59.4cm) high quality 216gsm paper. 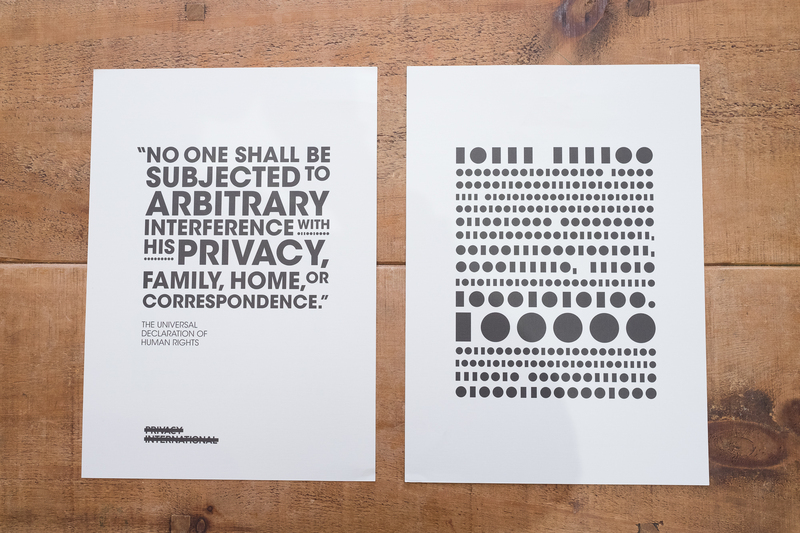 You will receive both a double sided Article 12 print AND our ‘Fingerprint’ poster. Both printed on A2 (42x59.4cm) high quality 216gsm paper. We have some exciting news to share with you! We are taking our landmark case against government hacking to the Supreme Court of the United Kingdom. The Court has granted us permission to appeal, which means our case will be heard by the highest court in the UK. As you may remember, our case challenges a judgment by the Investigatory Powers Tribunal, which sanctioned the UK government's use of ‘general warrants’ to hack. General warrants allow the government to hack broad categories of people or property, without any individualised suspicion. During those proceedings the government asserted (and the Tribunal agreed) that it would be lawful in principle to use a single warrant to hack every mobile phone in a UK city. What will be at issue at the Supreme Court is the government's dangerous argument that the UK courts should have no power to overturn a decision made by the Tribunal, no matter how unlawful, or how much it violates our fundamental rights. A victory for the government would be a significant blow to a fundamental principle of our legal system, which is that the general courts have the power to correct miscarriages of justice, and to ensure specialised courts like the Tribunal are held accountable to the rule of law. This principle is particularly critical in a case about government surveillance, because of its inherent secrecy. So it's especially vital that the Tribunal's decisions and the government are held to the highest level of public accountability. We will update you when the Supreme Court sets the date for our hearing. In the meantime, thanks so much again for the support you have given us, which is what has enabled us to come this far in this important battle. To learn more about our work on hacking, including our development of a set of minimum safeguards governments should apply if they hack, please visit https://privacyinternational.org/topics/government-hacking. Thanks again for being a part of this remarkable case! First we want to thank you again for raising almost £9,000 towards our legal costs. We also want to give you an important case update. Today, we received very disappointing news. The Court of Appeal dismissed our appeal, finding in favour of the government. 1. The government is arguing that our courts should not be allowed to review our challenge against the government's hacking powers, because the issue has already been decided by the Investigatory Powers Tribunal. But what if the tribunal makes an unlawful decision, as we believe it has done here? One of the key tenets of our legal system is that we have a court system that can review and overturn unlawful decisions by specialised tribunals. It is unprecedented for a tribunal to have the final word on the lawfulness of a decision they have made. 2. The substance of our case, about the government's massively intrusive hacking capabilities, is also of enormous public significance. We cannot allow governments to digitally break into and take control of our phones and computers, at scale, without any individualised suspicion. A final decision on this issue is too important to leave to the tribunal. We must let a higher court rule on a power that impacts so gravely on our freedom and democracy. Privacy International is currently subject to a 'protective cost order' (PCO) of £25,000, towards which your donation has helpfully contributed. If we go to the Supreme Court, we will request that this same PCO figure is carried over to the new proceedings. However, the Court might raise the ceiling so that we will have to pay an even greater sum if we lose at the Supreme Court. This raises the stakes for PI, but this is too important a fight for us to drop it at this stage. We have also incurred a number of direct costs, including filing fees at the various stages of the case. The money we have raised so far, and your contribution to it, will go towards meeting our costs order should we ultimately lose, as well as the direct costs we are incurring. Taking on the government, especially when it comes to their massive surveillance powers, was never going to be easy. But unchecked surveillance powers, especially those as intrusive as hacking our electronic devices, are too big a threat to our democratic freedoms and so we will fight on. Thanks for all your support so far! Firstly, we want to thank everyone who has so far generously donated to our appeal to challenge large scale UK government hacking. Your pledges bring us closer to raising the funds we need to continue our ongoing legal challenge. And because every donation that is made will be matched by an anonymous PI supporter, the value of your donation has been doubled! We also want to give you some further background to the case. In May 2016, we went to the High Court to challenge the Investigatory Powers Tribunal’s (IPT) decision that the UK government can use ‘general warrants’ to conduct large scale hacking, both of people in the UK and all over the world, without any individualised suspicion. Instead of addressing why they believe large scale hacking powers are necessary, the government instead chose to argue that the UK courts should not be allowed to review IPT decisions. We lost at the High Court. We have continued to fight and last week, we were at the Court of Appeal. The government's position has enormous constitutional significance. If it wins, it would be the first time in 350 years that our courts find that they don't have the power to review the legality of decisions of a lower tribunal like the IPT. It would mean that the decision of the IPT (which is the only body that hears human rights claims against the security services) can never be reviewed by a higher court, no matter how seriously it misinterpreted the law. We remain at significant financial risk and continue to need your support. If we lose at this stage of the case, we will owe £25,000 to the government. While we greatly appreciate the support you have already given us, we want to ask if you can support us further by asking 10 family members, friends, or colleagues to make their pledge or match yours. We're hoping you can get three of those people to make their pledges today or tomorrow! Please keep sharing our CrowdJustice appeal page on Facebook, Twitter and email!